Venison. It's here. It's really here. It's been almost a year since I first had the idea for Venison after a family member told me about the real Chronic Wasting Disease that has affected deer all over the nation. Since then, the entire book ran as a serial right here on my website, including a special short story by Bryan Todd about the origin of a certain character. Now, a revised, polished, and freshly edited version of the book is available in gorgeous print and eBook on Amazon. And that's freakin' awesome. Zombies are one thing, but a redneck on a power trip? That’s another horror altogether. Since the zombie threat struck their hometown, Gray and Callum have been on the road for weeks. Callum is the only friend Gray has left, and Callum’s dad in Tulsa may be the only family either of them has left—if he survived. So they’re hiking across the state, avoiding zombies along the way. When they stop in Stroud for supplies, they find themselves at the mercy of a hick with a god complex, a country gal who’s friendly except when she isn’t, and zombie that seems to be smarter than all of them. And who knows what monster escaped from the high school gym. 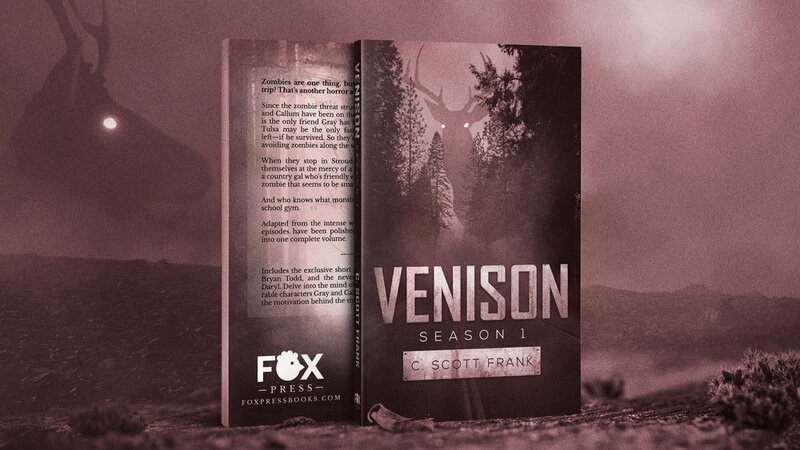 Adapted from the intense web serial, Venison, all 13 episodes have been polished, edited, and compiled into one complete volume. This is an exciting day for me. This is my largest single body of work to date, and I can't wait to start seeing it in the wild! Be sure and share to help me get the word out. Let the deer get weird. Not sure if you're ready to buy it? Read a sample above or get the whole first chapter free in your inbox.